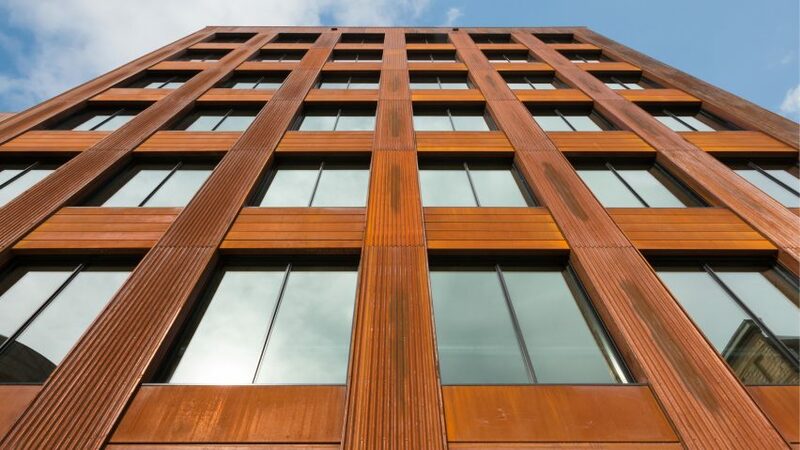 Trees killed by mountain beetles were used to construct this seven-storey tower in Minneapolis by Michael Green Architecture, which is described by the firm as the first modern tall wood building in the United States. As one of several architects embracing massive timber, or mass timber – the collective term for engineered wood products like glulam and cross-laminated timber – Canada-based Michael Green has pushed the limits of the material with his latest project. Called T3, which stands for timber, technology and transit, the building has a structure built entirely from wooden slabs, columns and beams. It is located in the city's North Loop neighbourhood, often referred to as the warehouse district, and contains 224,000 square feet of office and retail space (20,810 square metres). "T3 is currently the largest completed mass timber building in the US," said Green's firm, also known as MGA. "The design objective for T3 was to build on the character of the past with a modern perspective," added the Vancouver-based studio. "With changing building codes throughout North America, tall wood buildings will become more common. A pioneer in this building type, T3 has broken new ground and is perhaps a prototype for future commercial mass timber buildings." Glue- and nail-laminated timber were used to construct the roof, floor slabs, columns and beams, as well as pieces of furniture. "These modern materials bring the warmth and beauty of wood to the interior, and promote a healthy indoor environment for occupants," the studio said. Much of the lumber came from trees killed by mountain pine beetles. More than 60 million acres of North American forests have been wiped out due to the insect, whose population is increasing due largely to global warming, reports National Geographic. The wood structural system made it possible to erect the tower faster than a steel- or concrete-framed building of similar size, according to the firm. Workers constructed 180,000 square feet (16,720 square metres) of timber framing in under 10 weeks. The wooden structure yielded other benefits. The tower is lighter than a comparable steel or concrete building, which reduced the depth of the foundation. "Additionally, the embodied carbon in the building's wood structural system is lower than that found in conventional buildings found throughout most of downtown Minneapolis and the North Loop," the firm said. Externally the building is clad in corrugated panels of weathering steel. This is broken up by a grid of large windows, including ground-floor glazing that enables passersby to peer inside. Inside, the exposed timber structure is illuminated by lighting that is directed toward the ceiling. "The illuminated wood glows from the exterior similar to a lantern," said Candice Nichol, an associated at MGA who served as the project leader. She added that the wood's slight imperfections and colour variations "add to the warmth and character of the space". MGA is a self-proclaimed advocate for the wooden tall-building movement. Timber is a renewable, durable and carbon-sequestering material that provides a healthy indoor environment, the firm said. "As a designer, wood offers an evolving medium that is both complex and a new frontier for design," the firm said. "In many respects we are taking knowledge that disappeared a century ago and revitalising the next century of building more sustainably." Several designs for tall or mid-rise buildings made of structural timber have emerged in recent years, leading architects to call this period the "the beginning of the timber age". Within North America, SHoP Architects has designed a 10-storey residential tower in Manhattan that is set to become the city's tallest building constructed of structural timber. In Portland, Oregon, Lever Architecture has conceived a 12-storey tower made of cross- and glue-laminated timber. Similarly, Japanese architect Shigeru Ban has been commissioned to design a residential tower for Vancouver, which developers claim will be the tallest hybrid timber structure in the world. DLR Group, a Phoenix-based firm, served as the architect of record for T3.